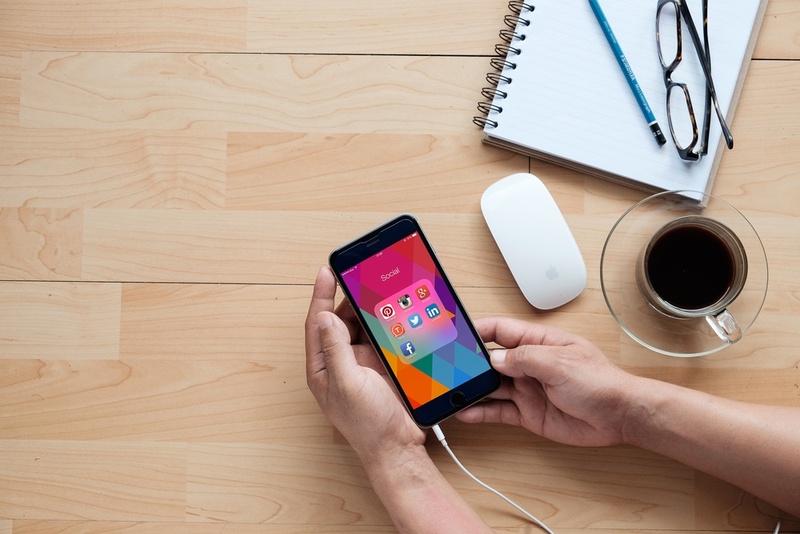 These are our 15 best practices for social media management on HubSpot. Instead of using a link shortener like bit.ly and add the shortened link to your post, use the full link. HubSpot will automatically shorten your URLs to 23 character ‘hubs.ly’ links for you to make them look cleaner and help keep you within Twitter’s 140 character limit. Why use hubs.ly links? Because HubSpot has its own tracking which only tracks direct clicks to the shortened URL, as opposed to other kinds of tracking (like social media sites’ own tracking) which track multiple interactions with a post or tweet as a click. When scheduling for Twitter, a real-time platform, avoid posting at the most common times for people to schedule their tweets, as yours has all likelihood of getting lost in a sea of tweets. For example, try posting at a lower frequency time such as 15.48 rather than 15.45. Just selecting a time a few minutes either side of a generic time can increase your tweet’s visibility. By associating each post to a relevant campaign, you can track the success of these posts together as a campaign in your Reports section. As you have several social channels, by connecting all relevant to the same campaign, you can collate all of these posts from various channels in one place. You can also add ‘campaign goals’ such as number of visits, customers and contacts generated. If you go to Productivity > Campaigns and find your campaign you can see all of the analytics for it. From here, you can also create workflows such as setting up a follow-up email to be sent when someone downloads a piece of content. If you create a tracking URL in HubSpot and choose the source (for example Twitter or Facebook) this pulls information into the Sources section of HubSpot (Reports > Sources). Then, when you look at your Sources reports, you can see where your traffic, contacts and customers are coming from and act on this knowledge accordingly. To create a tracking URL, first, copy the URL of the page you are linking to. Then, in HubSpot, go to Productivity > Campaigns. Choose your campaign then Create tracking URL (other sources). Enter your URL and click Generate. When creating a post, be sure to match the campaign to the campaign you used when creating the tracking URL. For each event you go to, create a new campaign. That way, if you assign all tweets and posts relating to this event to your dedicated campaign, you can track all interactions for the event as a whole, and track your ROI for this event. 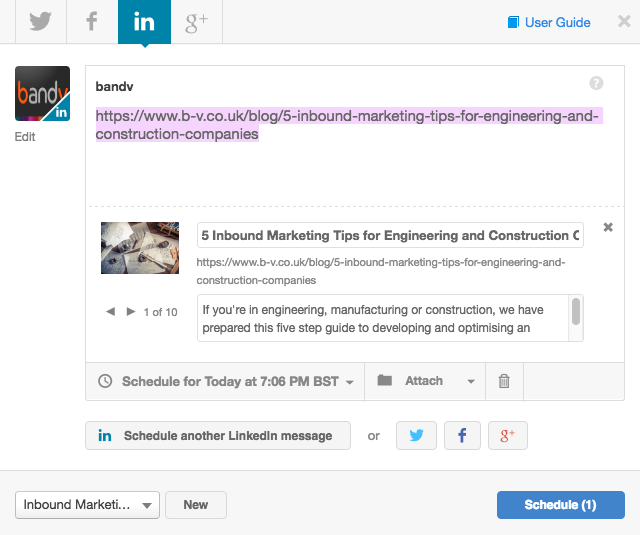 When you add a link to a Twitter post in HubSpot, there will be a pop up showing available images from the page. For all other channels, it will create a link box with an image, title and meta description for that URL. Use images for Twitter, and the link box for other channels as a lot of images won’t post on LinkedIn and Google+, though Facebook is more lenient with images. For Facebook, LinkedIn and Google plus, once you have added the link to your post and the link box appears, you can remove the link from the text. Your posts do not need to display the link box as well as the link in the text part of your post as well. Whereas you need to be economical with the 140 character limit on Twitter, you have no such restraints on LinkedIn, Facebook and Google+ as there is no character limit. While this doesn’t mean you should be writing essays, it does mean you can provide more information. Keep your posts engaging and succinct while communicating your core messages to your target audience. By clicking Export in the Publishing section, you can transfer your posts to a spreadsheet on your computer for further analysis and sorting. In the ’Published’ tab of the ‘Publishing’ section, you can keep track of your published posts across all channels. Select the timeframe, filter the channel and choose a campaign to easily find a specific post. Once you find the post, click on it to see likes, retweets and any contacts generated from this post. You can click on each contact generated to see when they downloaded a piece of content, as well as the information they provided via your form. Published posts that have performed particularly well and engaged your audience can be cloned so you can replicate your success. To find which posts have done the best, within your Published posts click on ‘Clicks’ or ‘Interactions’ on the top bar to arrange the posts from high to low. If you do need to delete a published post, remember you can’t delete LinkedIn posts from the HubSpot platform; you will have to do this by going to your LinkedIn page. You can delete published posts from Twitter, Facebook and Google+, however. In the Inbox section, you can see all your recent messages and notifications at a glance. You can also filter your incoming alerts to include just conversations, interactions, new followers and stream matches. In the Monitoring section, you can create streams for a keyword or account or even your brand name to monitor it across all of Twitter. With one click, you can watch relevant conversations unfold or keep tabs on an account of interest, so you can engage with posts quickly and conveniently. In the Reports section of the HubSpot Social tool, you can view an overview of your activity in terms of post frequency, clicks and interactions. Just specify a time frame and see how your social performance compares to a previous time frame.